12/01/2018 - The Hershey Bears dropped their third consecutive home game for the first time this season in a 4-2 loss to the Springfield Thunderbirds on Saturday night. Nathan Walker scored two goals for the Chocolate and White in the defeat. The opening frame featured a Bears goal in the first minute, as well as two fights and a 12-3 Hershey shot advantage. Right out of the starting gate, Walker snapped a wrist shot from the left wing past Samuel Montembeault's glove hand only 50 seconds in. Walker engaged in a fight with Bobby Farnham minutes later at 3:14, followed by a Liam O'Brien fight against Ryan Horvat at 5:57. Springfield immediately responded in the second period and grabbed a 2-1 lead with goals 40 seconds apart. First, Anthony Greco split the defense and entered on a semi-breakaway for the equalizing goal at 1:36. At 2:16, Blaine Byron finished a crisp, tic-tac-toe passing play to put the Thunderbirds in front. 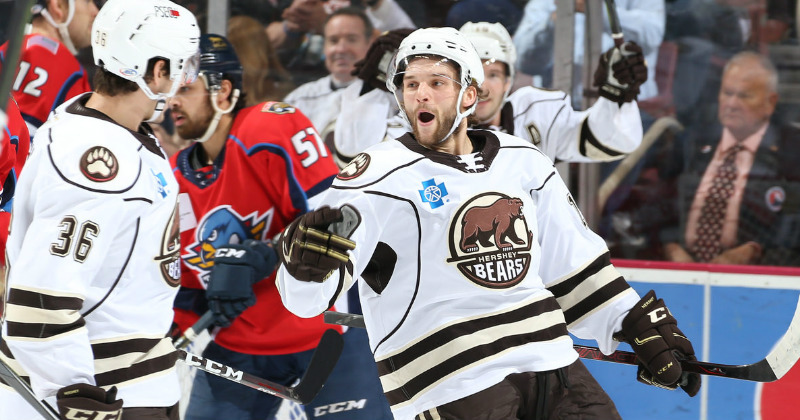 Walker continued to provide Hershey's only source of offense with a game-tying goal at 6:56. After an offensive zone face-off win by Mike Sgarbossa, Walker deflected a center point shot from Riley Barber to tie the game at 2-2. The Thunderbirds continued their strong second frame push and grabbed a 3-2 prior to intermission. At 10:08, Jacob MacDonald cleaned up a loose puck in the low-slot following a scrum in front of the net and scored on Bears goaltender Ilya Samsonov. Shots after 40 minutes were 18-12 Bears. Greco tallied his second goal of the night on a power move to the net at 11:03 of the third period to complete a 4-2 final scoring line. Final shots on goal were 25-18 Bears. Hershey's power play finished at 0-for-4 while the penalty kill went a successful 3-for-3. The Bears return to the ice on Sunday, December 2 versus the Binghamton Devils. It's CommunityAid & WGAL Teddy Bear Toss Night. All fans are encouraged to bring new or gently used, stuffed items to the game to toss onto the ice as the Bears score their first goal. All items collected will be donated to local charities. Puck drop is scheduled for 5 p.m.